The programmed death 1 (PD1)/programmed death ligand 1 (PDL1)/PDL2 pathway is an important negative costimulatory pathway that plays a key role in the inhibition of alloimmune responses and the induction and maintenance of peripheral tolerance (1–4). In vitro studies have shown that engagement of PD1 by its ligands inhibits proliferation and cytokine production by Ag-specific CD4+ and CD8+ T cells (5). In transplant models, administration of blocking anti-PDL1 mAb enhances alloantigen-driven T cell expansion in vivo, promotes Th1 differentiation, and accelerates graft rejection (6). Furthermore, administration of a PDL1-Ig fusion protein that triggers PD1 negative signaling prevents allograft rejection and facilitates tolerance induction when combined with anti-CD154 Ab or suboptimal doses of rapamycin (7). These studies demonstrate the negative regulatory function of the PD1 pathway in organ transplantation. A number of lines of evidence have suggested a second receptor for PDL1 aside from PD1. Recently, B7.1 has been identified as a second binding partner for PDL1 (8). The affinity of B7.1 for PDL1 is intermediate between the affinities of B7.1 for CD28 and CTLA4 but 3-fold less than the affinity of PDL1 for PD1. The PDL1–B7.1 interaction was found to induce an inhibitory signal into T cells in vitro (8). This signal could occur by either ligation of PDL1 on CD4+ T cells with B7.1 or ligation of B7.1 on CD4+ T cells with PDL1 (9). These results demonstrate a specific and significant bidirectional interaction between B7.1 and PDL1 that inhibits T cell responses. In light of the identification of the PDL1–B7.1 interaction, a reassessment of the roles of B7.1 and PDL1 in regulating alloimmune responses is necessary. In the current study, an anti-PDL1 Ab (10F.2H11) that solely blocks the PDL1–B7.1 interaction is used to investigate the function of this pathway in a murine cardiac transplant model. Furthermore, the mechanism of PDL1/B7.1-mediated regulation of alloimmune responses is explored. C57BL/6 (H2b, B6), B6.C-H2bm12/KhEgJ (bm12), B6.129S4-Cd80tm1Shr/J (B7.1KO), and B6.129S4-Cd86tm1Shr/J (B7.2KO) mice were purchased from The Jackson Laboratory (Bar Harbor, ME). PD1−/− (10) and PDL1−/− (11) mice on the B6 background and PDL1−/− mice on the BALB/c background (12) were maintained as a breeding colony in our animal facility. All of the mice were 8–12 wk of age and housed in accordance with institutional and National Institutes of Health guidelines. Vascularized heart grafts were placed in an intra-abdominal location using microsurgical techniques as described by Corry et al. (13). Graft function was assessed by the palpation of the heartbeat. Rejection was determined by complete cessation of palpable heartbeat and was confirmed by direct visualization after laparotomy. Graft survival is shown as the median survival time (MST) in days. The anti-mouse PDL1 mAb (MIH6), which blocks both PDL1–PD1 and PDL1–B7.1 interactions was generated by M. Azuma (14). The anti-mouse PD1 mAb (J43) was generated by H. Yagita. We have demonstrated previously the blocking properties of the mAbs against PDL1 and PD1 (15, 16). Both mAbs were manufactured and purified from the original hybridomas by Bio X Cell Culture (West Lebanon, NH). The anti-PDL1 mAb 10F.2H11 (2H11) solely blocks the PDL1–B7.1 interaction (9). PDL1 and PD1 mAbs were given i.p. according to the following protocol: 0.5 mg of mAb on the day of transplantation and 0.25 mg on days 2, 4, 6, and 8 after transplantation. Splenocytes harvested at 10–14 d after transplantation from wild-type (WT) B6, PD1KO, B7.1KO, and B7.2KO recipients of bm12 heart allografts were restimulated with irradiated donor-type splenocytes. The ELISPOT assay (R&D Systems, Minneapolis, MN) was adapted to measure the frequency of alloreactive T cells producing IFN-γ and IL-4 as described previously (17). The frequencies of cytokine-secreting alloreactive cells were expressed as the number of cytokine-producing cells per 0.5 × 106 responder cells. Splenocytes from B6 WT, PD1KO, B7.1KO, and B7.2KO recipients of bm12 hearts at 10 d after transplantation were stained with fluorochrome-labeled mAbs against CD4, CD8, CD62 ligand (CD62L), CD44, CD25, and Foxp3 (BD Biosciences, San Jose, CA). Intracellular Foxp3 staining was performed using the Cytofix/Cytoperm intracellular staining kit (BD Biosciences). Flow cytometry was performed with a FACSCalibur system (BD Biosciences) and analyzed using FlowJo software, assessing regulatory T cells (Tregs) (CD4+CD25+Foxp3+) as well as CD4+ and CD8+ effector memory (CD44highCD62Llow phenotype) and central memory (CD44highCD62Lhigh phenotype) cells. B6 WT skin was transplanted into BALB/c WT and PDL1KO recipients to sensitize T cells to alloantigen. Fourteen days after transplantation, spleens and lymph nodes from recipients were harvested, and CD4+ T cells were isolated by MACS by a CD4+ T cell Isolation Kit (Miltenyi Biotec, Auburn, CA). Sensitized CD4+ T cells (0.1 × 106) then were cultured with irradiated CD11c+ cells from Flt3 ligand-injected B6 WT or PDL1KO mice that were purified by MACS (130-052-001; Miltenyi Biotec). The purity of CD4+ and CD11c+ cells was estimated to be >95% by FACS. 2H11 or IgG control was added to wells at the optimized concentration of 40 μg/ml. Cell-free supernatants of individual wells were removed after 48 h of incubation and analyzed by a multiplexed cytokine bead-based immunoassay using a preconfigured 21-plex mouse cytokine detection kit (Millipore, Billerica, MA) as described above. Cardiac graft samples from transplanted mice were harvested at 14 and 56 d after transplantation, then fixed in 10% formalin, embedded in paraffin, coronally sectioned, and stained with H&E for the evaluation of the degree of rejection according to International Society of Heart and Lung Transplantation guidelines and elastin to evaluate vasculopathy according to the percentage of luminal occlusion by intimal thickening with a scoring system described previously (17) by light microscopy. An examiner blinded to the groups read all of the samples. Digital photomicrographs were acquired using a Nikon TE300 microscope and SPOT software (Diagnostic Instruments, Sterling Heights MI). Images were adjusted for brightness, contrast, and color balance only using Photoshop (Adobe Systems, San Jose, CA) software. Magnification ×20 with scale bars of 200 μm depicted on photos. Immunohistochemistry was performed on 5-μm-thick, formalin-fixed, paraffin-embedded tissue sections with anti-CD3 (CMC363; Cell Marque, Rocklin, CA; 1:1500, EDTA) and anti-Foxp3 (14-5773; eBioscience; 1:25, citrate) primary Abs. All of the stained slides were scanned using an Aperio ScanScope XT (Aperio Technologies, Vista, CA). Images were analyzed using ImageScope software (version 10.0.35.1800; Aperio Technologies) and a standard analysis algorithm (nuclear version 9.0; Aperio Technologies) with appropriate modifications for cell and nuclear sizes. Graft survival was expressed graphically using the Kaplan–Meier method, and statistical differences in the survival between the groups were assessed by the log-rank test. Student t test was used for comparison of means. A p value <0.05 was considered statistically significant. We have demonstrated previously that blockade of the PD1/PDL1 pathway by the PDL1 dual-blocker MIH6 mAb resulted in accelerated rejection in the bm12 into B6 cardiac transplant model (17). In this single MHC class II-mismatched transplant model, cardiac allografts are not acutely rejected but survive long term and develop severe transplant arteriosclerosis within 8 wk after transplantation (17, 18). To compare the effects of PD1 and PDL1 blockade, we use dual-blocker anti-PDL1 mAbs (MIH6) and anti-PD1 mAbs after transplant of bm12 hearts into B6 recipients. PD1 blockade was not as effective at shortening graft survival as PDL1 blockade (MIH6) (Fig. 1A). These results suggest that PDL1 may have an additional binding partner other than PD1. To test this hypothesis, we transplanted bm12 hearts into PD1-deficient B6 recipients and treated these recipients with the MIH6 anti-PDL1 mAb. Similar to anti-PD1 mAb treatment, PD1-deficient recipients did not accelerate bm12 graft rejection. Remarkably, PDL1 blockade accelerated allograft rejection in the PD1-deficient recipients (MST = 18.5 d, p = 0.0183) similar to the rejection in WT recipients given anti-PDL1 mAbs (Fig. 1A, 1B). Although neither PD1-deficient recipients nor WT recipients given anti-PD1 mAbs rejected the allograft within 8 wk in the bm12 into B6 cardiac transplant model, administration of MIH6 anti-PDL1 Ab resulted in graft loss by 40 d. These results are strongly suggestive of the existence of an alternative ligand for PDL1 other than PD1 that delivers a negative signal to T cells to downregulate the alloimmune response. Disparate allograft outcome after PD1 and PDL1 blockade in the single MHC class II-mismatched transplant model. A, The bm12 cardiac grafts transplanted into B6 WT recipients had a MST >56 d. Anti-PD1 mAb treatment had similar allograft survival times compared to those of the untreated group; however, allograft rejection was accelerated remarkably when recipients were treated with the dual-blockade MIH6 anti-PDL1 mAb. 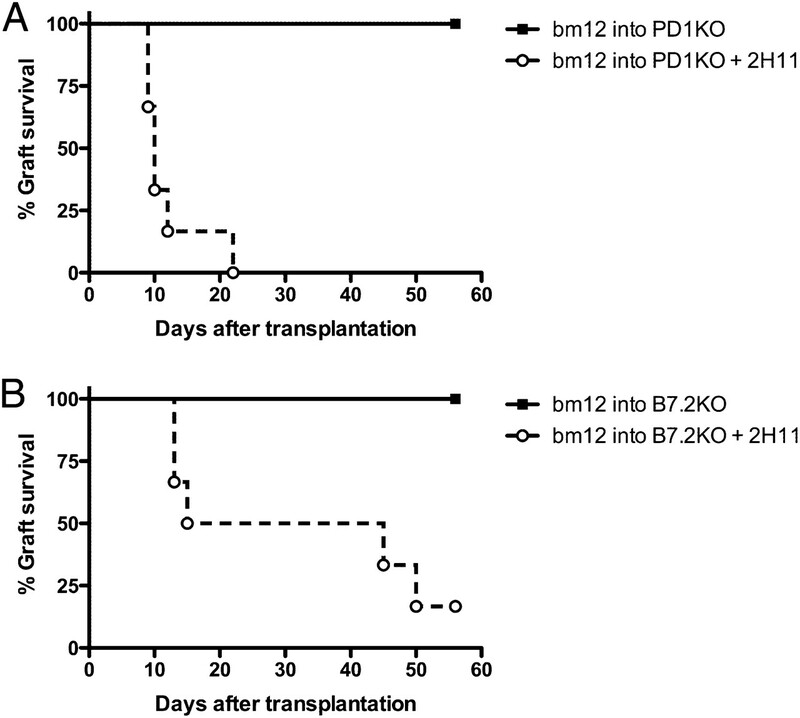 B, The bm12 cardiac grafts transplanted into PD1-deficient recipients had a MST >56 d. When PD1KO recipients were treated with anti-PDL1 mAb (MIH6), allograft rejection was accelerated remarkably despite PD1 deficiency. n = 6 for each group. To examine whether PDL1 binding to B7.1 in addition to PD1 can deliver an inhibitory costimulatory signal in vivo, we transplanted bm12 hearts into WT, B7.1-, or B7.2- deficient B6 mice and treated these recipients with the dual-blocker anti-PDL1 mAb (MIH6) (Fig. 2). The bm12 cardiac grafts transplanted into single B7.1KO (MST > 56 d, n = 6) or B7.2KO (MST > 56 d, n = 6) recipients had survival times comparable to those of WT recipients (MST > 56 d). In contrast, although PDL1 (MIH6) blockade accelerated allograft rejection in WT (MST = 34.5 d, n = 6, p = 0.0032) and B7.2-deficient recipients (MST = 10.5, n = 6, p = 0.0007), it failed to do so in B7.1-deficient recipients. Grafts in MIH6-treated B7.1 recipients survived long term in a fashion similar to those of untreated recipients (Fig. 2). These data clearly indicate that PDL1 interaction with B7.1 functions to regulate alloimmune responses in vivo. PDL1 blockade leads to accelerated cardiac allograft loss in B7.2-deficient but not B7.1-deficient recipients. The bm12 cardiac grafts transplanted into B6 B7.1- or B7.2-deficient recipients had a MST >56 d. When treated with MIH6 anti-PDL1 mAb, B7.2-deficient recipients rejected all of the allografts within 10 d (B), whereas allografts survived long term in B7.1-deficient recipients (A). n = 6 for each group. Molecular analysis of the PDL1 binding sites by chemical cross-linking revealed that the PDL1/B7.1 interface overlaps at least partially with the PDL1/PD1 interface (8). 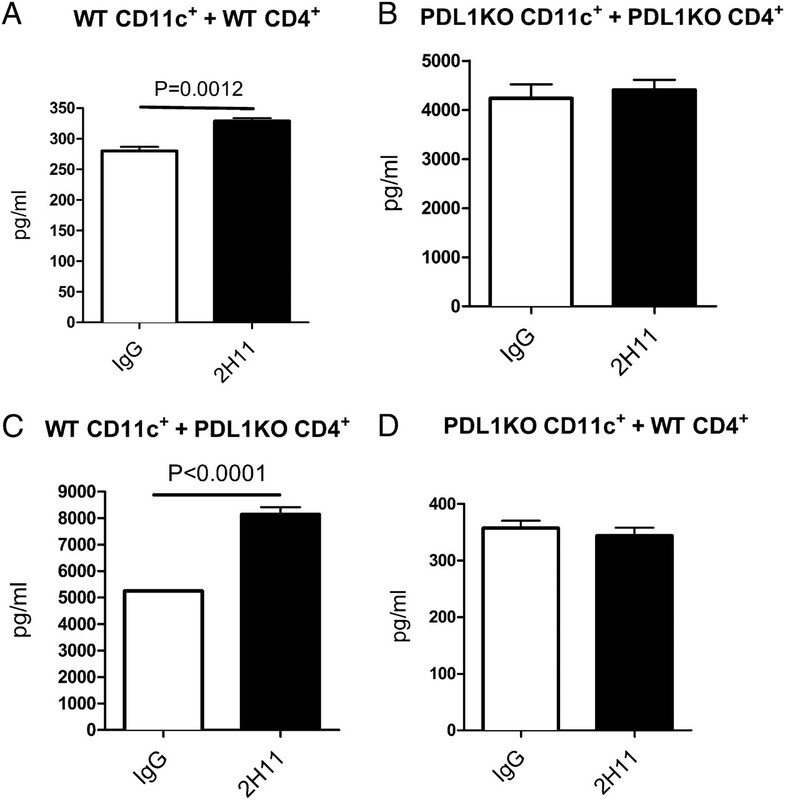 Consequently, blocking Abs might interrupt PDL1–B7.1 as well as PDL1–PD1 interactions. The capacity of an array of anti-PDL1 mAbs to interfere with PDL1–B7.1 or PDL1–PD1 interactions has been tested by adhesion assays (8). 2H11 was identified as the only mAb to solely block the PDL1–B7.1 interaction (9). We took advantage of this novel 2H11 anti-PDL1 mAb to explore the unique role of the PDL1–B7.1 interaction in regulating alloimmune responses. We first transplanted bm12 hearts into B6 WT recipients and treated recipients with 2H11 mAb (Fig. 3). Unlike the dual-blocker MIH6 anti-PDL1 mAb, all of the allografts treated with 2H11 survived long term (>56 d). 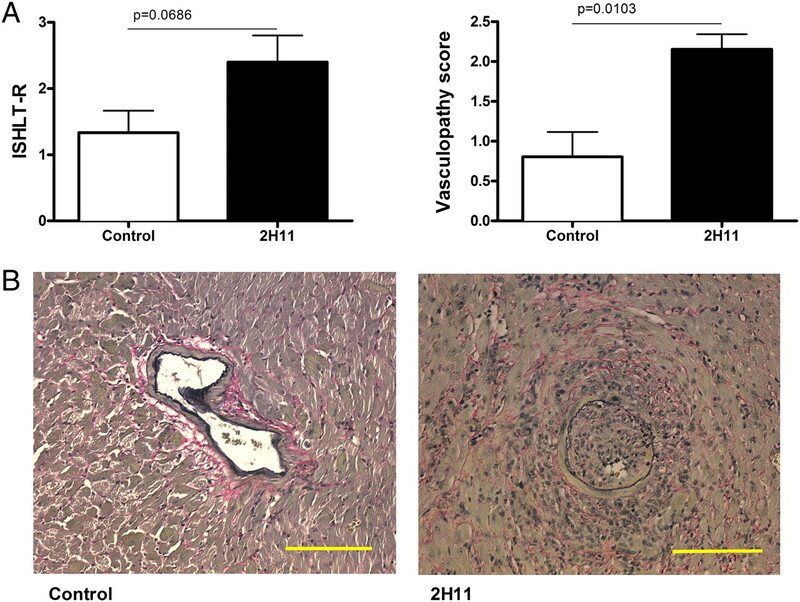 However, the pathology of the allografts treated with 2H11 mAb and harvested 56 d after transplantation showed a significantly higher vasculopathy score (2.15 ± 0.30 versus 0.80 ± 0.18, p = 0.0103) as compared with that of the untreated animals. The 2H11 treatment also intensified the allograft rejection score, although this did not reach statistical significance (2.40 ± 0.40 versus 1.33 ± 0.33, p = 0.0686). Blockade of the PDL1/B7.1 pathway leads to enhanced cardiac allograft vasculopathy in the single MHC class II-mismatched transplant model. The hearts from bm12 mice were transplanted into B6 WT recipients and treated with 2H11 anti-PDL1 mAb, which exclusively blocks the PDL1/B7.1 pathway. A, 2H11 treatment significantly increased vasculopathy score by 56 d after transplantation as compared with that with no treatment. International Society of Heart and Lung Transplantation grade also was increased, although differences did not reach statistical significance. Values shown represent the mean ± SEM histological score obtained from three individual mice. B, Representative photomicrographs of elastin staining show advanced vasculopathy in 2H11-treated allografts. Scale bars, 200 μm. To ensure that the effect of 2H11 mAb treatment is due to blockade of the PDL1–B7.1 interaction and not blockade of the PDL1/PD1 pathway, we used PD1KO mice on a B6 background as recipients of bm12 hearts. The administration of 2H11 anti-PDL1 mAb led to accelerated bm12 allograft rejection in PD1KO recipients (MST = 10 d), whereas controls survived long term (>56 d) (Fig. 4A). These data indicate that 2H11 functions by blocking the PDL1–B7.1 interaction. Blockade of the PDL1/B7.1 pathway accelerated cardiac allograft rejection in the PD1- and B7.2-deficient recipients. 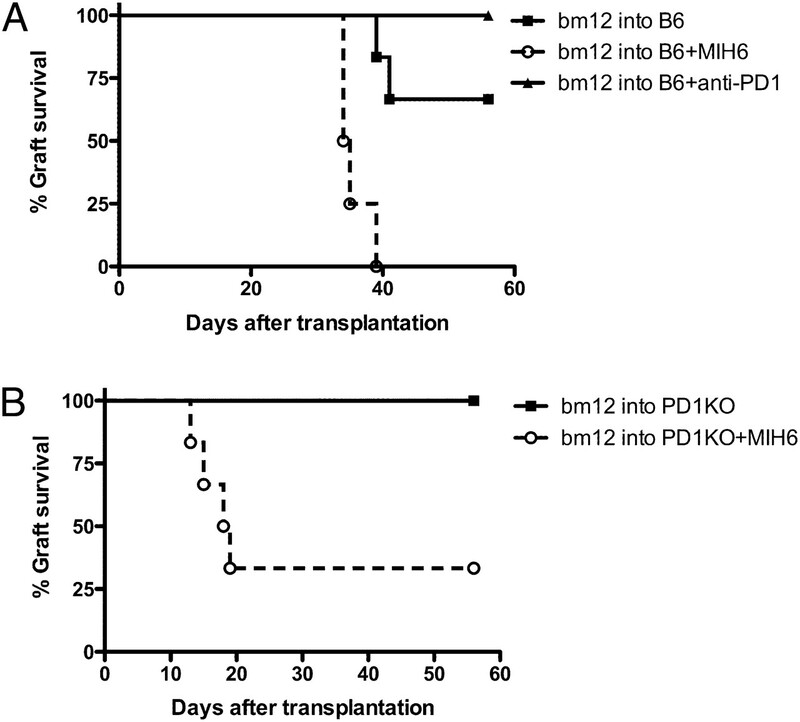 A, The bm12 hearts were transplanted into PD1KO recipients, and the recipients were treated with 2H11 anti-PDL1 mAb. The survival times of the cardiac allografts were shortened significantly as compared with those of controls. B, The bm12 hearts were transplanted into B7.2-deficient B6 recipients, and the recipients were treated with 2H11. The bm12 cardiac grafts transplanted into B6 B7.2-deficient recipients had a MST >56 d, whereas 2H11 precipitated allograft loss. n = 6 for each group. To further confirm that 2H11 interferes with PDL1 binding to B7.1, we transplanted bm12 hearts into B7.1- and B7.2-deficient B6 recipients and treated with 2H11. 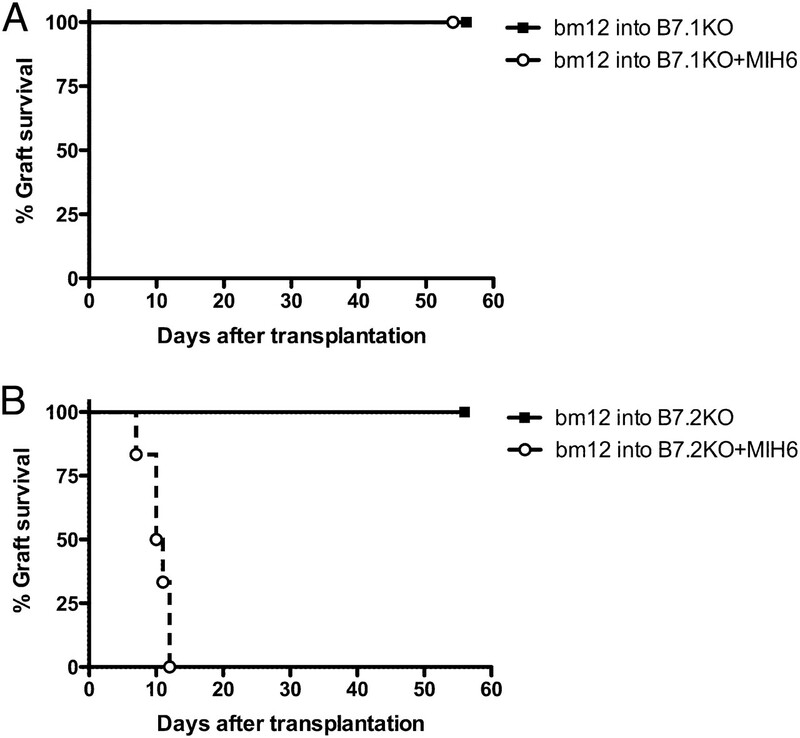 Although 2H11 accelerated allograft rejection in B7.2KO recipients (Fig. 4B), it failed to do so in B7.1KO recipients, all of whose grafts survived long term, similar to those in untreated WT recipients (data not shown). These data clearly show that 2H11 anti-PDL1 mAb can accelerate allograft rejection only when the PDL1 and B7.1 interaction is present. This confirms that PDL1 can interact with B7.1 to inhibit an aggressive alloimmune response in vivo. Analysis of the frequency of alloreactive cytokine-producing cells in B6 recipients of cardiac grafts from bm12 mice by ELISPOT at 10–14 d after transplantation showed that the frequency of alloreactive T cells producing IFN-γ in 2H11 mAb-treated recipients was increased by 2.7-fold over that of untreated recipients (Fig. 5A). A similar increase was seen in IL-4– and IL-6–producing alloreactive T cells, with 4.8- and 11.2-fold increases in 2H11-treated recipients, respectively, compared with control B6 WT recipients (Fig. 5B, 5C). PDL1/B7.1 blockade upregulates production of Th1, Th2, and proinflammatory cytokines in B6 recipients of bm12 hearts. IFN-γ (A), IL-4 (B), and IL-6 (C) production by the splenocytes from B6 recipients of bm12 heart grafts assessed at 10 d after transplantation by ELISPOT. Data represent the mean ± SEM of triplicate wells from three mice per group. 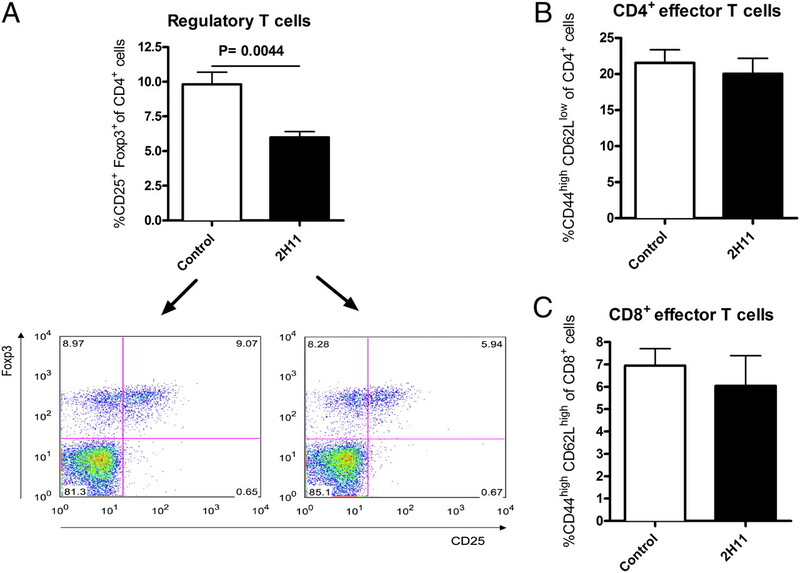 To investigate the effects of 2H11 on the regulatory/effector T cell balance, we compared the percentages of CD4+CD25+Foxp3+ Tregs and CD4+ and CD8+ effector/memory T cells in splenocytes from B6 WT recipients of bm12 cardiac grafts 10–14 d after transplantation in 2H11 mAb-treated or untreated recipients. The percentages of CD4+ and CD8+ effector/memory cells phenotype (CD44highCD62Llow phenotype) were similar among the 2H11 mAb-treated or untreated recipients (Fig. 6B, 6C). However, 2H11 mAb treatment did significantly decrease the percentage of CD4+CD25+Foxp3+ Tregs (5.98 ± 0.4252, n = 5, p = 0.0044) as compared with no treatment (9.81 ± 0.88, n = 5) as well as the absolute cell count of Tregs (3.66 × 106 ± 0.49 versus 6.07 × 106 ± 0.53, p = 0.02970). These data suggest that the PDL1/B7.1 pathway may play a role in Treg homeostasis. However, the decrease in the percentage of CD4+CD25+Foxp3+ T cells in the spleen from 2H11-treated mice also could be due to a relocation of Tregs from spleens to the allografts. Therefore, we stained cardiac allografts for Foxp3 by immunohistochemistry to clarify this issue. The Foxp3 staining within cardiac allografts showed no significant difference between both groups (1.96 ± 0.28% versus 2.39 ± 0.28%, p = 0.3832), indicating that the reduction of Tregs in the spleen was unlikely to be related to relocation. PDL1/B7.1 blockade decreases CD4+CD25+Foxp3+ Tregs in spleens of B6 recipients of bm12 hearts without affecting effector T cells. FACS analysis of splenocytes from B6 recipients of bm12 hearts with or without 2H11 treatment at 10–14 d after transplantation showed that 2H11 treatment resulted in a significantly lower percentage of CD4+CD25+Foxp3+ Tregs than controls (A). The percentages of CD4+ and CD8+ effector/memory phenotype (CD44highCD62Llow) were similar between the 2H11-treated and control recipients (B, C). Bar graphs show means ± SEM. All of the results are representative of at least three different sets of experiments. To dissect the function of the bidirectional interaction of PDL1 and B7.1, we used an in vitro culture assay in which a combination of APCs and T cells from WT and PDL1KO mice were used in the presence of either 2H11 or control IgG. B6 WT skin was transplanted into fully MHC-mismatched BALB/c WT and PDL1KO recipients to sensitize T cells to alloantigen. Fourteen days after transplantation, spleens and lymph nodes from recipients were harvested, and CD4+ T cells were isolated and cultured with irradiated CD11c+ cells from Flt3 ligand-injected B6 WT or PDL1KO mice. 2H11 was able to mildly increase IFN-γ production by CD4+ T cells when PDL1 was present on both APCs and T cells in vitro (Fig. 7A); however, no effect was seen when PDL1 was absent on both cells (Fig. 7B). In addition, 2H11 did not enhance IFN-γ production when PDL1 was absent on CD11c+ cells alone (Fig. 7D). Interestingly, 2H11 increased IFN-γ production when PDL1 was present on the APC side but absent in T cells (Fig. 7C). These findings suggest a dominant direction of the PDL1–B7.1 interaction, whereas PDL1 on CD11c+ APCs transmits preferentially an inhibitory signal via B7.1 on T cells and this pathway is effectively blocked by 2H11 mAb. The interaction of PDL1 on APCs with B7.1 on T cells plays a dominant role in bidirectional interactions between these two molecules. Fourteen days after B6 WT skin was transplanted into BALB/c WT or PDL1KO recipients, spleens and lymph nodes from recipients were harvested, and CD4+ T cells were isolated. CD4+ T cells then were cultured with irradiated CD11c+ cells from Flt3 ligand-injected B6 WT or PDL1KO mice. Cell-free supernatants of individual wells were removed after 48 h of incubation with 2H11 or control IgG and analyzed by a Luminex assay for IFN-γ production. 2H11 mildly increased IFN-γ production by CD4+ T cells when PDL1 was present on both APCs and T cells (A); however, no effect was seen when PDL1 was absent on both cells (B). In addition, 2H11 did not enhance IFN-γ production when PDL1 was absent on CD11c+ cells alone (D). 2H11 increased IFN-γ production when PDL1 was present on the APC side but absent in T cells (C). Bar graphs show means ± SEM. All of the results are representative of at least three different sets of experiments with three mice. PD1 has been defined as a negative regulator of immunity, limiting the activation of B and T cells and protecting against autoimmunity (19). The PD1 surface molecule is predominantly expressed on activated T and B cells and is able to interact with at least two ligands: PDL1 and another closely related molecule PDL2. Signaling through PD1 has been shown to have a greater effect on cytokine production than on cellular proliferation, suppressing the production of IFN-γ, TNF-α, and IL-2 via its effect on the PI3K signaling pathway (9). Therefore, further exploring this pathway might lead to potentially promising targets for the induction of allograft tolerance. Indeed, our group has shown previously that PDL1 is required for peripheral tolerance and protection from chronic allograft rejection (20). Interestingly, when this pathway is blocked in vivo, several studies have found a greater effect of PDL1 blockade in precipitating rejection when compared with either PD1 or PDL2 blockade, and this has been attributed initially to differences in the expression of PDL1 and PDL2 or in the half-lives and/or affinities of the blocking Abs (6, 20). In addition, the presence of a second stimulatory receptor for PDLs also was postulated (21–23). We recently identified B7.1 as a second binding partner for PDL1 and showed that there are bidirectional interactions between B7.1 and PDL1 that can inhibit T cell responses in vitro (8). In this study, we showed that PD1 blockade by using either mAbs or genetically deficient mice was not as effective at shortening graft survival as PDL1 blockade (MIH6) in a single MHC class II-mismatched cardiac transplant model. This finding suggests that PDL1 has an additional binding partner in addition to PD1 and that this interaction might be important for the fate of the alloimmune response. With the use of B7.1- or B7.2-deficient mice as recipients of bm12 hearts, we further showed that PDL1 blockade could only accelerate allograft rejection when B7.1 was present. This confirmed the recent finding identifying B7.1 as an additional binding partner for PD1 (8). Exploring the importance of the PDL1/B7.1 pathway in transplantation in vivo raised numerous challenges, including the broad expression pattern of these receptors on T cells, APCs, and nonhematopoietic cells as well as its potential bidirectional signaling characteristics. By using a dual-blocker MIH6 anti-PDL1 mAb (M.J. Butte and A.H. Sharpe, unpublished observations), we have shown previously that blocking PDL1–B7.1 and PDL1–PD1 interactions significantly shortens allograft survival of bm12 hearts (17). On the basis of the special characteristics of the specific blocking mAb 2H11 that solely blocks the PDL1–B7.1 interaction, we were able to further explore the function of this pathway in a cardiac transplant model. The 2H11 mAb is a novel Ab that has been shown previously to block the interaction of 300.19 PDL1 transfectants with the B7.1-Ig fusion protein but not the PD1-Ig fusion protein in a cell adhesion assay (9). We found that blockade of the PDL1–B7.1 interaction by 2H11 mAbs remarkably aggregated allograft vasculopathy, although there was no effect on the allograft survival in the bm12 into B6 cardiac transplant model. We also showed that this blockade significantly enhanced the alloimmune response by upregulating the frequencies of IFN-γ–, IL-4–, and IL-6–producing cells. These findings demonstrated that the PDL1–B7.1 interaction was important for the inhibition of the alloimmune response in vivo. These data together with the results with PD1 blockade indicate that sole blockade of either the PDL1–PD1 or the PDL1–B7.1 interaction has a reduced effect on alloimmune responses as compared with the dual PDL1 blockade, suggesting some non-overlapping functions. However, to directly compare the contributions of the PDL1/PD1 and PDL1/B7.1 pathways requires the development of a specific anti-PDL1 mAb that exclusively blocks the PDL1–PD1 interaction. Moreover, both 2H11 (Fig. 4A) and MIH6 anti-PDL1 (Fig. 1B) Abs were able to accelerate allograft rejection in PD1-deficient recipients, indicating that blockade of the PDL1–B7.1 interaction has a much more profound effect when PD1 is absent. PD1 and PDL1 are highly expressed on Tregs, but the role of the PDL1/PD1 pathway in expansion or function of Tregs is not yet clear (24, 25). Recent studies have identified key roles for PDL1 (26) and PD1 (27, 28) in promoting Treg development and function. In this study, we showed that blockade of the PDL1–B7.1 interaction might impair the generation of Tregs in vivo, consequently enhances alloimmune immune responses, and aggravates allograft vasculopathy. Our findings are consistent with those of a recent publication by Yi et al. (29), suggesting a similar importance of the PDL1–B7.1 interaction in Treg generation. However, the mechanism by which the PDL1/B7.1 pathway controls Tregs needs further investigation. Because both PDL1 and B7.1 are expressed on T cells, B cells, dendritic cells, and macrophages, there is the potential for bidirectional interactions between B7.1 and PDL1 on these cell types. Our findings in this study point to a potential role of PDL1 on CD11c+ APCs in transmitting an inhibitory signal via B7.1 on T cells, suggesting a potential dominant direction for the PDL1–B7.1 interaction. These data are consistent with a recent report from Park et al. (30) showing that an inhibitory signal through B7.1, but not PDL1, on T cells is responsible in part for the tolerogenic effects of the PDL1–B7.1 interaction. However, due to the expression of PDL1 on a broad range of cells, our in vitro experiments are limited by the use of selected cell combinations. For example, these studies are unable to address the possible role of the interaction of PDL1 expressed on nonhematopoietic cells with B7.1 on T cells, which have been shown recently to be important in the alloimmune response in vivo (17). Moreover, additional effects of other hematopoietic cell interactions in vivo cannot be accounted for. In summary, our present study demonstrates that the PDL1–B7.1 interaction inhibits alloimmune responses in vivo. Accumulating evidence shows that B7.1 is an additional binding partner for PDL1 and this interaction may also result in the suppression of an aggressive alloimmune response. These findings provide a rationale for a new therapeutic approach by targeting PDL1/B7.1 pathways to improve the long-term outcome of the allograft. Our results also have potentially important therapeutic implications for the use of Belatacept (LEA29Y). Belatacept is a second-generation human CTLA4-Ig that selectively blocks B7 receptors on APCs, and it was approved recently by the U.S. Food and Drug Administration for the prevention of acute rejection in kidney transplant patients. However, B7 blockade by Belatacept might adversely affect negative signaling by PDL1 and, therefore, impair long-term allograft survival. Further studies will be needed to elucidate the overall importance of this pathway in the maintenance of a tolerogenic state. We thank Dr. Ibrahim Batal for technical help.
. 1999. Transplantation tolerance: the concept and its applicability. Pediatr. Transplant. 3: 181–192.
. 2000. Engagement of the PD-1 immunoinhibitory receptor by a novel B7 family member leads to negative regulation of lymphocyte activation. J. Exp. Med. 192: 1027–1034.
. 2001. B7-DC, a new dendritic cell molecule with potent costimulatory properties for T cells. J. Exp. Med. 193: 839–846.
. 2001. PD-L2 is a second ligand for PD-1 and inhibits T cell activation. Nat. Immunol. 2: 261–268.
. 2003. Blockade of programmed death-1 ligands on dendritic cells enhances T cell activation and cytokine production. J. Immunol. 170: 1257–1266.
. 2005. Role of the programmed death-1 pathway in regulation of alloimmune responses in vivo. J. Immunol. 174: 3408–3415.
. 2003. Stimulating PD-1-negative signals concurrent with blocking CD154 co-stimulation induces long-term islet allograft survival. Transplantation 76: 994–999.
. 2007. Programmed death-1 ligand 1 interacts specifically with the B7-1 costimulatory molecule to inhibit T cell responses. Immunity 27: 111–122.
. 2007. PD-1 regulates self-reactive CD8+ T cell responses to antigen in lymph nodes and tissues. J. Immunol. 179: 5064–5070.
. 1973. Primarily vascularized allografts of hearts in mice. The role of H-2D, H-2K, and non-H-2 antigens in rejection. Transplantation 16: 343–350.
. 2002. Expression of programmed death 1 ligands by murine T cells and APC. J. Immunol. 169: 5538–5545.
. 2003. The programmed death-1 (PD-1) pathway regulates autoimmune diabetes in nonobese diabetic (NOD) mice. J. Exp. Med. 198: 63–69.
. 2003. Preferential contribution of B7-H1 to programmed death-1-mediated regulation of hapten-specific allergic inflammatory responses. Eur. J. Immunol. 33: 2773–2782.
. 2008. Critical role of donor tissue expression of programmed death ligand-1 in regulating cardiac allograft rejection and vasculopathy. Circulation 117: 660–669.
. 2008. Control of peripheral T-cell tolerance and autoimmunity via the CTLA-4 and PD-1 pathways. Immunol. Rev. 224: 166–182.
. 2007. PDL1 is required for peripheral transplantation tolerance and protection from chronic allograft rejection. J. Immunol. 179: 5204–5210.
. 2006. Immunoregulatory role of B7-H1 in chronicity of inflammatory responses. Cell. Mol. Immunol. 3: 179–187.
. 2003. B7DC/PDL2 promotes tumor immunity by a PD-1-independent mechanism. J. Exp. Med. 197: 1721–1730.
. 2003. Cooperative B7-1/2 (CD80/CD86) and B7-DC costimulation of CD4+ T cells independent of the PD-1 receptor. J. Exp. Med. 198: 31–38.
. 2003. CD4+CD25+ regulatory cells from human peripheral blood express very high levels of CD25 ex vivo. Novartis Found. Symp. 252: 67–88; discussion 88–91, 106–114.
. 2005. Murine vascular endothelium activates and induces the generation of allogeneic CD4+25+Foxp3+ regulatory T cells. J. Immunol. 175: 6265–6270.
. 2006. Estrogen-mediated immunomodulation involves reduced activation of effector T cells, potentiation of Treg cells, and enhanced expression of the PD-1 costimulatory pathway. J. Neurosci. Res. 84: 370–378.
. 2010. Down-modulation of programmed death 1 alters regulatory T cells and promotes experimental autoimmune encephalomyelitis. J. Neurosci. Res. 88: 7–15.
. 2011. Host APCs augment in vivo expansion of donor natural regulatory T cells via B7H1/B7.1 in allogeneic recipients. J. Immunol. 186: 2739–2749.
. 2010. B7-H1/CD80 interaction is required for the induction and maintenance of peripheral T-cell tolerance. Blood 116: 1291–1298.